Paradise on Earth Cake with flavorful layers of blessed messenger cake, sharp cream pudding, cherry pie filling, whipped garnish, and almonds. Smooth and wanton, this cherry fool is a certain group pleaser! 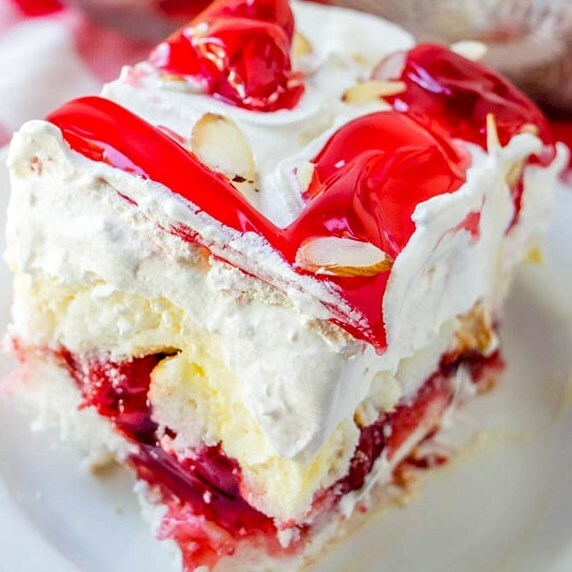 Paradise on earth cake, I before long found, is a cooler cake made with layers of cubed fluffy cake, vanilla pudding with acrid cream, cherry pie filling, whipped besting, and toasted almond fragments. This sweet is really a cherry fool. Why it's called paradise on earth, I have no clue. G believes this is a result of the utilization of fluffy cake. I believe this is on the grounds that each nibble resembles discovering paradise on earth. It's so easy to make; you'll be wonderfully astonished how incredibly flavorful it turns out with scarcely any exertion. So natural in truth the hardest piece of the formula is sitting tight for it to set and chill! Bake angel food cake according to package's directions. Allow to cool and cut into cubes. In a bowl, combine pudding mix, milk, and sour cream and beat until smooth. Set aside. In a 9x13 baking dish, arrange 1/2 of cake cubes in a layer. Spoon 2/3 of cherry pie filling over cake. Place the remaining 1/2 of the cake on top of pie filling. Spoon pudding over cake and spread evenly. Spoon and spread whipped topping over pudding layer. Garnish cake with the remaining pie filling and toasted almonds. Chill for about 4 to 5 hours.